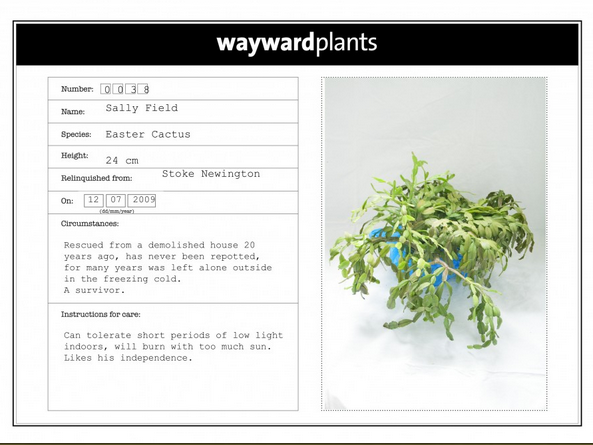 Wayward Plants calls itself “a project of social exchange and botanical desire,” and in addition to numerous initiatives that serve to beautify forgotten spaces, encourage urban farming and implement techie ‘Plant Thirst Detectors’ in the landscaping of locations like Google’s UK campus, they offer an actual registry for truly wayward plants, that is, those in need of a new home. With a story like that, we’re not sure how someone could abandon Sally Field again, but there she is, in need of a new home. ← DJ decks made of… paper?